Almost since the beginning of photography, photographers concerned with the built environment have photographed industrial buildings. The development of photography both as a professional practice and as an art form coincided with Modernism, a cultural movement which emerged out of social changes brought on by industrialization and urbanization. Photography was both a by-product of Modernism, and its handmaiden, and therefore the perfect medium to record the physical manifestations of cultural change, both in the commercial world and in architecture. In fact, photographs of early industrial buildings, such as grain elevators, helped shape Modernism, by influencing the education and development of the first generation of purely Modernist architects, such as Le Corbusier. It’s ironic that photography only gained widespread acceptance as an art form in the Postmodern era, beginning in the 1960s. At the same time, the photography of industrial architecture, which helped usher in Modernism and was originally futuristic in its outlook, began to look backward, now serving as both an artistic and research tool to document the Modern era as it began to recede. No one epitomized this shift more than Bernd and Hilla Becher, the German couple who spent their lives photographing early industrial buildings and structures, such as water towers, blast furnaces and grain elevators. They published several thousand images in what they called typologies, actually extensive series of photographs that served to classify their industrial subjects by architectural characteristics. Though often classified as conceptual artists because of a narrow and rigorous aesthetic vision they brought to their subject matter, they were actually rather conventional, if obsessive, documentarians whose clear-eyed vision of industrial architecture in the past inspired a whole generation of German photographers to depict the present with similarly astute and dispassionate vision. A further and unforeseen evolution of this type of photography in our own era has been the widespread documentation of urban and industrial ruins. 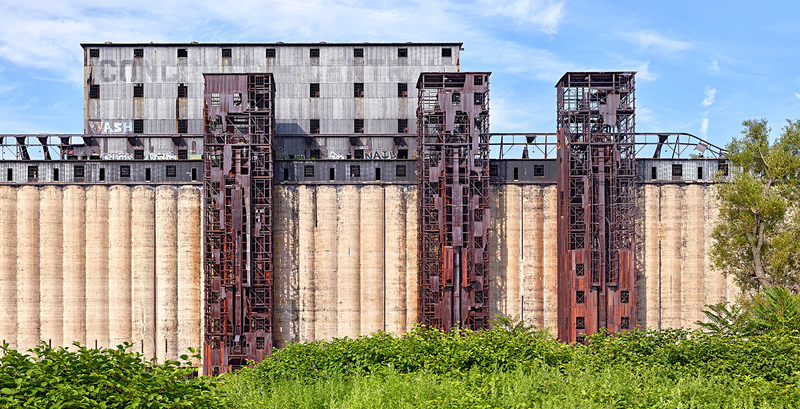 Many architectural photographers, including luminaries such as Edward Burtynsky and Robert Bourdeau, are drawn to the highly tactile subject matter of industrial decay because of the material’s visual complexity and its implicit social and historical narrative. While many accomplished artists depict such subject matter more or less faithfully, there are hundreds, perhaps thousands, of mostly amateur, often accomplished, photographers, also drawn to this complex visual material, who produce highly stylized and sentimental images (using HDR or high dynamic range processes pushed to the extreme) that are painterly in their effect. It is no exaggeration to say that this type of urban photography has completely supplanted the natural landscape as a subject for many younger photographers. The worst examples of this photography are the photographic equivalent of paintings on black velvet, but the more restrained examples of this type of work by young, adventurous photographers are contributing to architectural documentation and urban history. As a photographic artist, I find myself attracted to various elements of these approaches to the built environment. From the beginning of my work, I have documented the urban landscape. I admire the depiction of industrial forms by early-twentieth century photographers such as Charles Sheeler, or later figures, such as Ezra Stoller, who embraced and extolled Modernism. At the same time I am emotionally drawn to photographing the buildings that remain of the pre-Modernist and early-Modernist eras before they completely disappear from our urban environments. While looking backwards, I try to make these photographs without sentiment. I am not wistful for the past, but I am nostalgic for the cityscape of the mid-twentieth century which had a much more human scale than our cities of today. It’s the preservation of the past, including industrial buildings, that makes our cities interesting, but more than that enables us to understand the evolution of the urban environment which increasingly defines our lives. I also like to believe that photography of buildings of the past, and the awareness such photographs help to create, can have an influence on the way our cities are shaped in the future.